Temporarily, I’m living within driving distance of Walden Pond (Concord, MA), one of my favorite spots anywhere. I began visiting there around 14 years ago when I lived in the Boston area. It’s the place I learned to relish swimming in open water, an activity that once filled me with immeasurable dread. 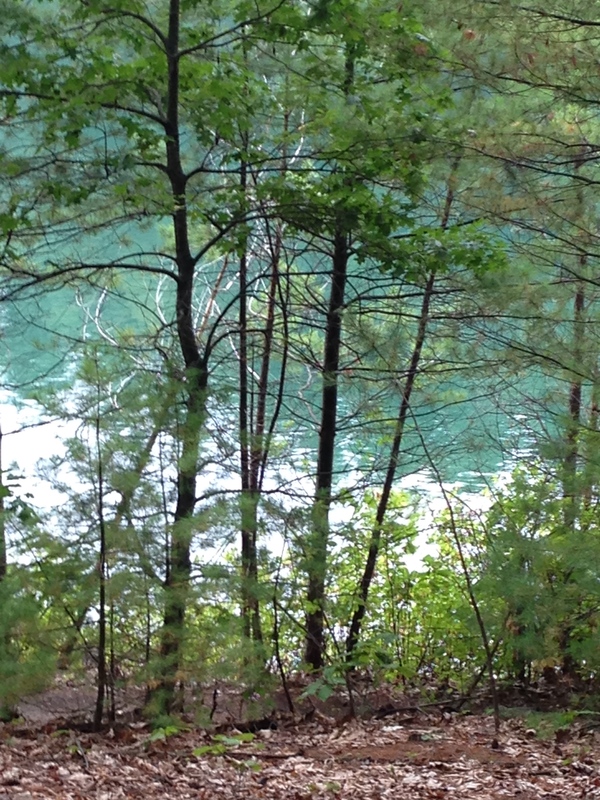 Unlike other local swimming holes, Walden Pond is more of an oasis than most, its water fresh and clear, painted in inviting shades of blue and green, the surface usually tranquil rather than choppy, the surrounding woods acting as a bezel for the gem of the pond. Immersing myself in the water and swimming across and back (about one mile in total) proved to be a sure fire way to beat the blues, reset my nervous system and experience a few moments of near complete merging with the natural world. When I’m in the pond, “I”, as in my ego identity, ceases to exist. My normally hyperactive mind quiets. I become awareness itself, or life energy that is not attached to any particular story, agenda or outcome. Since I’m not training for an athletic event, I don’t concern myself with speed or time. Sometimes I’ll pause in the water, submerge my face, and look at my hands and feet, pale limbs against the darker watery backdrop. While I know that they belong to “me”, whoever that is, I don’t feel terribly possessive about them; nor do I observe them with a critical eye. I marvel at their shapes, and that they will eventually get me to shore. Perhaps that is how a turtle considers its own appendages, if at all. Since swimming at Walden offers an instant cessation of mind chatter and provides immediate existential relief, I’ve developed a fairly consistent habit when I visit. Often I put on my bathing suit before hand, to save time. After parking my car, I’ll head to the water’s edge, leave my towel and car keys behind, apply sunscreen, don my swimmers cap and goggles and wade into the water. On my return to shore, after swimming straight across and back, I’ll towel off, change clothing, and leave, rather than linger and savor the scene. Last week or so, I realized that I had been “doing Walden” the same way for a long time. What had initially felt like an invigorating ritual had become more routine; still satisfying, but without freshness or hint of adventure. In Feldenkrais, we practice doing the same thing at least three different ways. Could I change my Walden experience? About 10 days ago I decided to spend more than just an hour there. I began my visit by walking some wooded trails around the pond’s perimeter. After completing a circuit, I turned around and walked in the opposite direction. I glimpsed some small beach areas and private nooks far from the main beach and bathhouse. Perhaps I could initiate my swim from a new launching point. That day, however, I decided to swim along the edge of the pond, which I had never tried before. It’s a bit longer than going across and back, but also offers the opportunity to rest along the shore and observe how others enjoy the place. Along the way, I passed patient fishermen quietly casting lines, kayakers and paddle boarders alighting on shore, flitting dragonflies and a family of mallards floating near the water’s edge. At one point, relatively far from shore, I ran aground on the pond’s suddenly shallow bottom and had to walk to deeper water. Choosing this new route, more akin to driving in traffic than along an empty country road, explained my original preference to head straight for the middle of the pond, considered less safe than swimming close to shore but offering its unique form of sanctuary. Last weekend I went to Walden again. The parking lot and pond, shrouded in fog, made me doubt my decision to spend several hours there. I didn’t want to dive immediately into the formless grey so I started again with a walk, this time along the ridge trail, further from shore. The rain of preceding days rendered the woods a vibrant green. A small brown toad paused on a mossy trunk. Even the decaying trees, bark peeling and trunks split, lichen overtaking their surfaces, seemed alive with green and begged to be touched. Through the trees I spotted the water, turquoise and smooth, disturbed only by what I believe was a heron. After I completed my circuit, I began my usual swim. By then the fog had lifted but the sky still hung low and grey. As I returned to shore the weather shifted; the sun came out, the sky morphed blue, and more visitors descended on the pond. Sitting on the beach, drying off, I recognized one woman and went over to say hello. In chatting with her, I realized I wanted to stay rather than leave. I returned to the car to retrieve my lunch, which I ate by the water. While resting and digesting, I decided to go for a second swim, something I hadn’t considered before, believing that a mile was my daily limit and feeling that I had to set a quota on my time there, as if pleasure must be rationed. To discover that I had the capacity to swim more gently surprised me; to allow the day to gradually and slowly unfold, like an Awareness Through Movement lesson, complete with pauses, proved to be a huge gift. This is such a satisfying post, Ilona. I can feel myself with you, the water, the sky, the deep green, the physical resistance and buoyancy of the medium, the inside and outside worlds living so closely to each other. Lovely. Thank you. Thanks, Kim! The experience itself was deeply satisfying, a rare moment when I was able to acknowledge that (or allowed myself the space and time to let the satisfaction seep in). Hence the blog post, to remind myself! Sounds meditative…I have to make a plan for myself. No swimming holes but perhaps a walk would do. Walking can be just as amazing! I hope you’ll give yourself the gift of a walk. As always a joy to read your posts!